The World Day against Child Labour was first launched in 2002 aiming to raise awareness and activism to prevent child labour by the initiative of International Labour Organisation (ILO) The World Day against Child Labour, which is held every year on June 12, is intended to foster the worldwide movement against child labour in any of its forms. For MJC which is set up with a vision of empowering the girl child through education this is an important day and dour children planned for a variety of programs to make this a memorable day. The celebration began with an awesome show presented by the students of the Michael Job College of Arts and Science. The house activity on this occasion was a poem recitation competition. The contest was held at the chapel from 3:00-4:00 p.m. The students were divided into three categories. Grades 1-4th belonged to the first category, grades 5-8th belonged to the second category and the third category consisted of 9-12th grades. The evaluation was based on the selection of the poem, expressions and fluency. 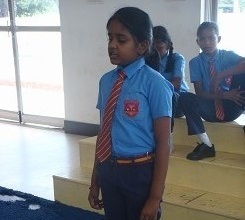 Some students recited poems by eminent poets and some recited poems written by them. The winners of the 1st category were Jessica Digal (green), Keerthika (yellow) and Stella Sherpa (green). Vanitha (blue), Celia Rai(red) and Silvana Rai (yellow) were the winners from the 2nd category. The 3rd category had Devika Sharma (yellow), Liana (blue) and Swapna (yellow) as its winners.